My two DS3612xs boxes, next to an old MacBook Pro 15". Green lights represent occupied disk bays. In our house we have used one or more NAS devices for many years. We started with a Infrant ReadyNAS X6, and over the years updated to ReadyNAS NV+'s. (Infrant was purchased by Netgear along the way, and, in my humble opinion, the ReadyNAS line stagnated as a result). We used these devices for multiple purposes. Our house is loaded up with Apple products. We have Apple TVs hooked up to three televisions, an old MacBook Pro being used as an iTunes server and to serve movies to the Apple TVs (we own a large collection of Bluray and DVD disks that we've converted for use by iTunes over the years), and a few other MacBook Pro's and Air's in use at various times by different family members. Since my daughter was born, I've taken tens of thousands of photos of her, which generates a lot of data (I take photos in RAW format using a variety of Sony cameras). At last count it was 3 TB or so. We also generate a lot of backup data using Time Machine with each of our MacBooks (around 2TB there). And that digital movie collection is eating up 6TB. Not to mention digital music, a pile of Xcode projects and other data I like to keep synchronized between my daily driver MacBook Pro and my travel MacBook Air, and various other bits of data. Fundamentally, a NAS enables us to provide what looks like one or more shared drives that can be accessed by any of our devices (including iPhones and iPads) from anywhere in the house (or, in fact, from anywhere in the world). It also takes the place of Apple's Time Capsule, allowing our Macs to backup wirelessly anywhere in the house without having to plug in a network cable or a USB drive. While we could hook up storage to our "server" MacBook Pro and share it from there, a stand-alone device is more reliable and efficient (and, in the case of the Synology Diskstations, provides more built-in functionality without having to mess with additional software or hardware). After data ubiquity, the other important feature of a NAS is data safety. NAS's universally offer one or more "RAID" options that allow one to sacrifice some storage space in exchange for reduced risk of data loss. A NAS is essentially a "headless" (i.e. monitor-less) computer with space for multiple hard drives. ("Hard drive" as used here is intended to include both spinning magnetic media and solid-state "SSD" drives). By setting RAID options appropriately, the NAS can compensate for the probability that one of the hard disks will eventually die by dedicating some of the available disk space to holding error-correcting information (such as parity bits). For example, if the NAS provides four slots for hard drives, one could place four 4TB drives inside for a theoretical maximum of 16TB available (unformatted) disk space. But if one assumes that there is a 5% chance of any drive failing in a given year, with four drives there is approximately a 19% chance that at least one will fail. The more drives in the box, the higher the likelihood that at least one drive will fail. For example, again assuming a 5%-per-drive failure rate, a box with six drives has a 27% chance that one will fail. If, however, one uses a RAID configuration that provides sufficient redundancy to withstand a single drive failure, then in the four disk case one starts with a theoretical maximum of only 12TB available (unformatted) disk space. However, since now two drives must fail before any data is lost, the chance of failure in a given year (again assuming a 5%-per-drive failure rate) drops from 19% to 1.4%. In the six-drive case, the probability of losing data drops from 27% to 3.3% (one must give up a disk's-worth of capacity, however, meaning a maximum unformatted space of 20TB instead of 24TB in the six-disk case, assuming 4TB disks). And while these sorts of failure rates may seem unimpressive, keep in mind that a failure requires two disks to fail at the same time. This is extremely unlikely, under most circumstances. Moreover, some NAS's provide the option for two-disk redundancy. This means three disks must fail, at the same time, for data loss to occur. Consider the Synology NAS that is the subject of this review - it can hold twelve disks. 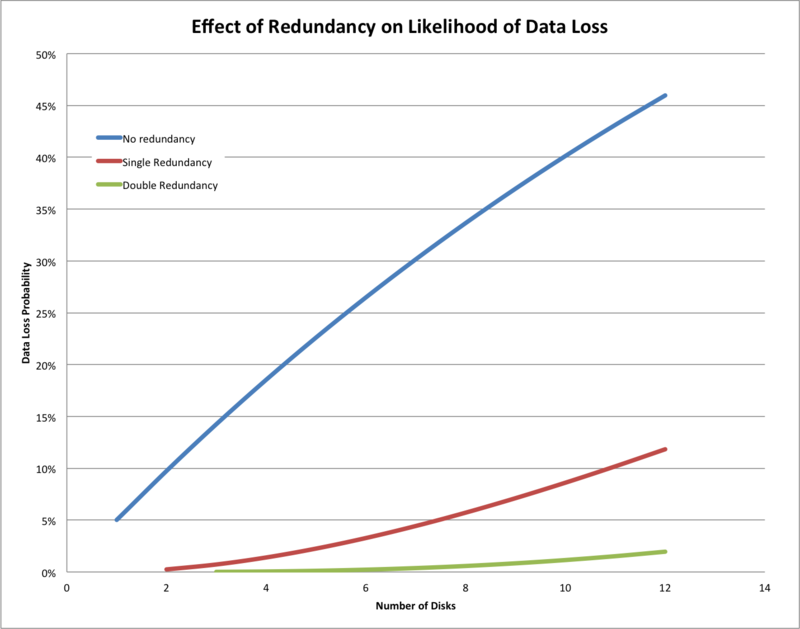 Without any redundancy, assuming 5% disk failure rate, there is a 46% chance of data loss. With one-disk redundancy, this drops down to 12% (again assuming two failures at the same time). With two-disk redundancy, the chance of data loss drops to 2%. Redundant disks greatly reduce the risk that data will be lost due to disk failure. This becomes extremely important as the number of disks increases. For most products of these type, when a disk failure occurs you are notified somehow, and have an opportunity to replace the disk and "rebuild" the array, which happens without data loss. 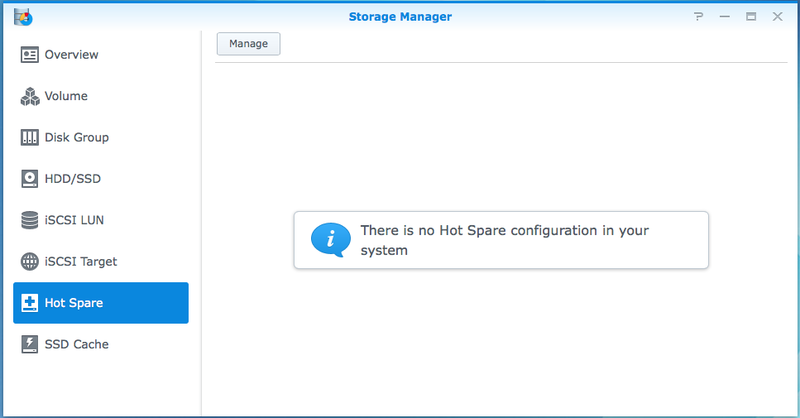 In the better NAS products (like the Synology), one can "hot swap" the drive. This means one can pop out the broken drive, replace it with a new one, and never have to shutdown or reboot the NAS. Devices can continue to read and write the NAS, albeit it a bit more slowly, and everything keeps on running as normal while the RAID array repairs itself (a process that can take on the order of 24 hours). As long as one quickly replaces a broken drive, the chances of multiple simultaneous drive failures - and corresponding drive loss - are minimized. Disk space - The ReadyNAS models I had been using each only had 4 disk slots. Further, they had difficulty with drives even as large as 4TB (in large part because as a long-time owner I had initially set them up with smaller disks, and for historical reasons, to support 4TB disks would have required me to erase the NAS and start over). This meant I was effectively limited to around 6TB on each box. Noise - The ReadyNAS models I had were loud due to excessive fan noise. Reliability - Updating the firmware became a scary process, as updates, particularly to the original X6 model, caused "bricking" that required me to reformat the array and start over. User interface - the user interface was... let's just say bad. Speed - the user interface would frequently become completely unusable due to speed. The drive array, itself, would frequently bog down to the point where if someone was doing a Time Machine backup, one couldn't stream a movie from the array without a massive amount of video stuttering. Safety - although RAID brings some amount of safety against failure of individual disks, it's not infallible Multiple-disk failures are possible, and the NAS, itself, can fail (e.g. RAM could go bad, the power supply could fail, the fan could stop working, etc.) So for added safety I backed up from one NAS to another, which never seemed to go smoothly. The backups struggled with large files, files with names that were perfectly legal on Mac OS X but not on Windows, etc. I never felt as though all my files were properly backed up. After doing some research, it seemed to me that the two best alternatives were Synology and QNAP, but in the end I decided to go with Synology primarily for the massive expandability of the DS3612xs model. Before we get to much further, I will readily acknowledge - this particular model is extreme overkill for almost everybody, at least as far as a home-based device is concerned. However, after years of trying to incrementally accommodate ever-increasing data storage needs in my house, I decided I wanted to bite the bullet and buy something that would be able to grow with me for as long as possible. In addition to holding twelve drives on its own, the DS3612xs has two sockets into which additional DX1211 expansion units can be plugged. Each of these expansion units can also hold 12 disks, for a total of 36 disks. 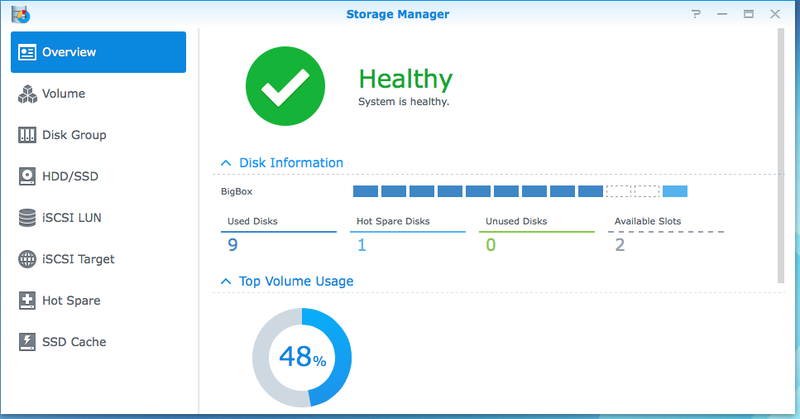 Currently the Synology OS allows a maximum volume size of 108TB, a number that will likely be increased given the recent announcement of 8TB and 10TB hard drives by Seagate. The nice thing about Synology, however, is that they offer many different products with different capacities and expansion capabilities, covering the entire range of possible uses (and price points). Each behaves nearly identically and uses the same OS and user interface. After using the DS3612xs I was so impressed that I bought another one, this time pre-owned via the Amazon website, and set it up to backup the first one and provide additional safety and peace of mind. I will briefly talk about some of the other Synology boxes that may make more sense in the average household with smaller amounts of data. So how does the DS3612xs score on the problems that drove me away from ReadyNAS? As already discussed, the DS3612xs provides space for 12 disk drives. The Synology Hardware Compability List provides a list of drives that Synology has tested as being compatible, and includes at least one 6TB drive as of the time this was written; folks on the forums have also reported compatibility with more such drives, and there's no reason to expect that the newly announced Seagate 8TB and 10TB drives won't work. With two-disk redundancy, and 10TB drives, this would permit 100TB of useable space. Given the 108TB Synology volume limit, this means the entire 100TB can be presented to connected computers as if was a single giant disk. If used with two DX1211 expansion units, that's 300TB of usable space (though one would have to set the space up as at least 3 separate "volumes." Each "volume" appears as a single disk to connected computers, for example in the Mac Finder sidebar. The DS3612xs, like the ReadyNAS, allows on-the-fly "expansion" of the array. This means that one can add a new drive into an empty slot and trigger a re-build of the volume to add the new space (or a portion of the new space - some will be used for redundancy) to the array. Again, this can be done without turning off or rebooting the device, and the device can continue to be used while this is happening. One can also pull out a drive and replace it with a drive with higher capacity. Again, the array can be rebuilt to make use of the additional space. This allows incremental expansion of capacity when it's needed. Given that hard drive prices are always falling, it's nice that I can purchase new drives when space gets low instead of having to fully populate the box at the beginning. Of course I always keep a couple spare drives handy just in case a disk fails and I need to replace it. 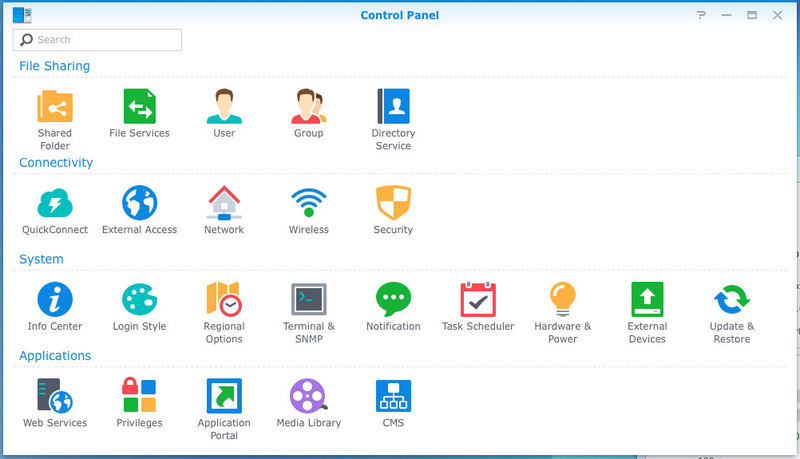 Additionally, Synology provides SHR and SHR-2 as options. One advantage of the SHR options is that it allows use of more space on the drives when the drives are not all the same size. In traditional RAID, if all the disks are 4TB except one is 1TB, only 1TB will be used on each drive. Only when the 1TB drive is upgraded to 4TB can the array be rebuilt to use all that extra disk space. With SHR, most of the disk space on most of the disks is actually used (for data or redundancy), even when the disks vary in size. This is a nice option for home use as the price curve for disks is such that the most-bang-for-the-buck size changes rather quickly, and old "hand-me-down" drives may become available from other devices around the home. One thing to keep in mind is that you can't add drives to an existing SHR-2 array if they are smaller than the drives you originally started out with. So if you start with 4 1TB drives and a 4TB drive, and then upgrade the rest to 4TB drives, you can't add a 500GB drive to an existing SHR-2 volume. (You can, however, use the 500GB drive as part of a new volume in the same box.) You can, however, add the 1TB drives back in as "new" drives to expand the volume (though in my experience you have to format them first. More on that later.) The Synology RAID Calculator is an on-line resource for illustrating approximately how much unformatted disk space is available for use by data based on drive choices and RAID configuration. Actually performing the rebuild of the array to handle a newly replaced or additional hard drive is a simple affair. Unlike with the ReadyNAS, user intervention is required. In theory, the ReadyNAS would detect the new drive and automatically perform a rebuild, but in reality this seemed to work only around 33% of the time. With the DS3612xs, one needs only go to the device's web-based interface and select the "storage manager" application. This provides a list of volumes, with a "manage" button at the top. Clicking on "manage" when there are unallocated (i.e. 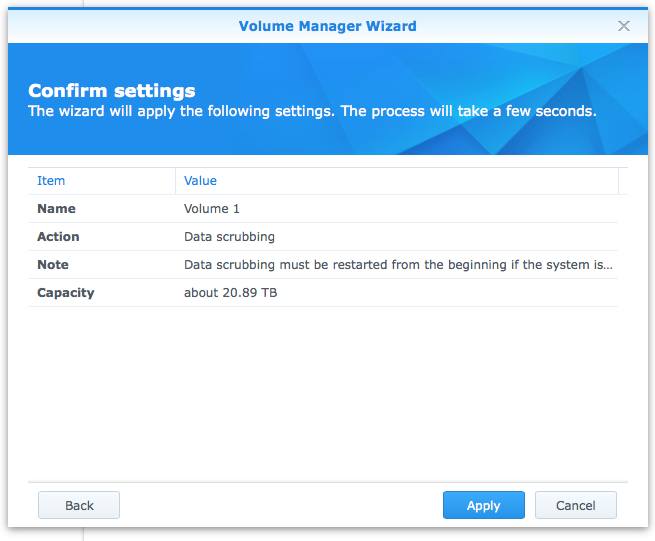 new or replaced) disks in the box provides the option to add the new disk (or disks) to the selected volume. Once this is done, the process of rebuilding the array begins. During the entire process, the box can continue to be used as normal, albeit it with slower disk accesses. The interface remains fully responsive, and disk accesses, in my experience, are still plenty quick enough to permit two simultaneous Time Machine backups while simultaneously streaming at least two videos to Apple TVs (via a PC or Mac running iTunes - the box doesn't directly support Apple TV for video streaming). The array rebuilding process occurs in four stages. The first two stages involve "checking" (and writing, as appropriate) parity bits used for redundancy. In effect this means that the data is distributed onto the new disk. The final two stages add the disk to the array and increase the writeable volume capacity as appropriate. The web-based interface also provides at-a-glance information about other capacity-related issues. This includes the number of disks, which disks are assigned to which volumes, the size and condition of the disks (including S.M.A.R.T. status, which is used to provide information about the health of each disk that can, in some cases, predict imminent disk failures), etc. Note that if an SSD is placed into the box it can be used to provide caching, potentially greatly speeding up disk access in situations where a small portion of the storage space is used frequently. It's also possible to provide a "hot spare" that is used automatically when a disk failure is detected. This is a good idea, for example, in situations where one is going to be away from the box for an extended period of time (e.g. on vacation). 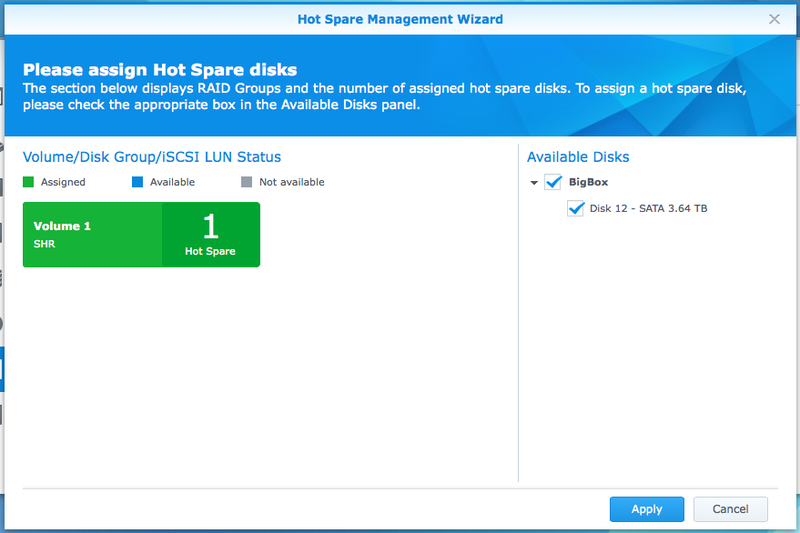 If a disk failure occurs, one doesn't have to panic that a second disk might fail before the first can be fixed so long as the "hot spare" option is used and an extra disk is placed in the box. Setting up a hot spare is trivially easy. First, install a spare hard drive, at least as large as the biggest drive in the volume (you can assign different hot spares to different volumes if you'd like). Typically this involves using a key to unlock the drive caddies, pulling out a caddy, screwing the hard drive to the caddy with four screws, and reinserting the caddy. I've turned the key on the left box to unlock the drive caddies, and removed caddy number 10 (right column, second row from the bottom). Sliding the caddy over the spare drive until the holes line up. The caddy has many holes, but only four are used with this type of disk. Select the "Hot Spare" option and you will see if you already have any hot spares assigned. To add a hot spare, just click the "Manage" button. If the box contains any disks that aren't currently assigned for some other purpose, it will be listed in the right pane. 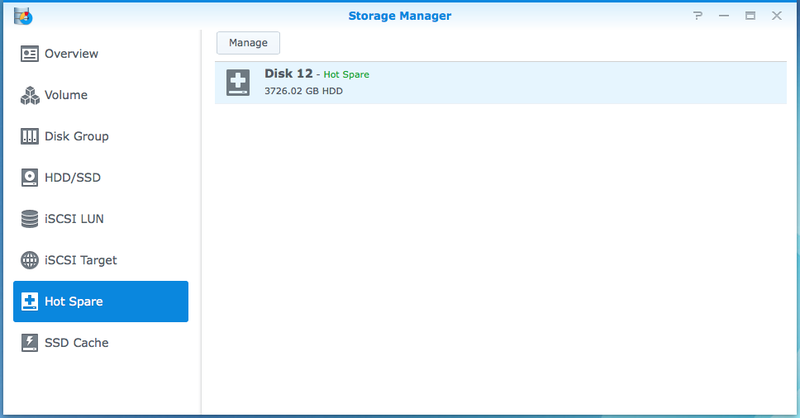 Select the disk(s) you wish to add as hot spares, and you can choose which volume to assign them to. Once this is done, we can see that the hot spare has been assigned. 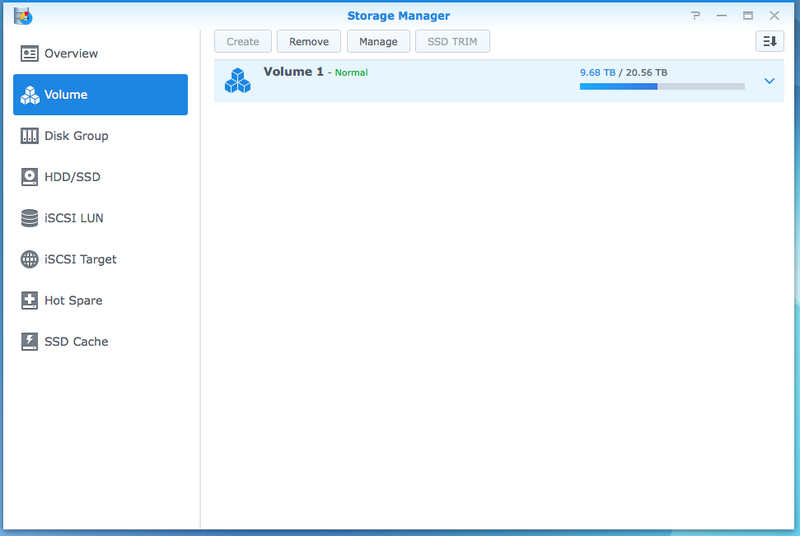 This is also reflected on the Storage Manager Overview screen. Since I just recently started using a hot spare, I haven't yet had the (unfortunate) opportunity to test it in action. I have upgraded the space in each NAS several times, both by replacing existing drives and adding new drives. This has worked every time without any hiccups. It takes about 24 hours for the rebuild to occur, but this depends on the amount of data in the array and the size and number of disks in the array. During this time it's nice to have the comfort of two-disk redundancy, as otherwise if a disk failed I'd suffer data loss. The closest I've ever come is once while rebuilding the array I received a warning that a disk was acting funny, and two days after the rebuild completed that disk completely failed. Since rebuilding the array stresses the disks somewhat, a disk failure may be slightly more likely, so two-disk redundancy seems like a really good idea. All of my drives are Seagates. These seem to have higher initial failure rates than other drives, but often are cheaper and seem to last a long time if they don't fail early on. Mixing drives from multiple manufacturers can be somewhat troublesome since not every 4TB has exactly the same number of bytes, and in certain situations a new disk must be the same size or bigger than existing drives, and cannot be even a tiny bit smaller. Disks from the same manufacturer with the same rated size usually have identical capacity, avoiding this problem. The DS3612xs's are much quieter than the ReadyNAS's they replaced. I haven't attempted to quantify the noise, but they are quieter than the 2009 MacBook Pro they sit next to when the MacBook's fan is running. The sound is a gentle white noise which isn't annoying at all, and I simply don't find their sound to be an issue. The specification say the sound level is 29.4 dB(A) at a meter's distance, for what it's worth. 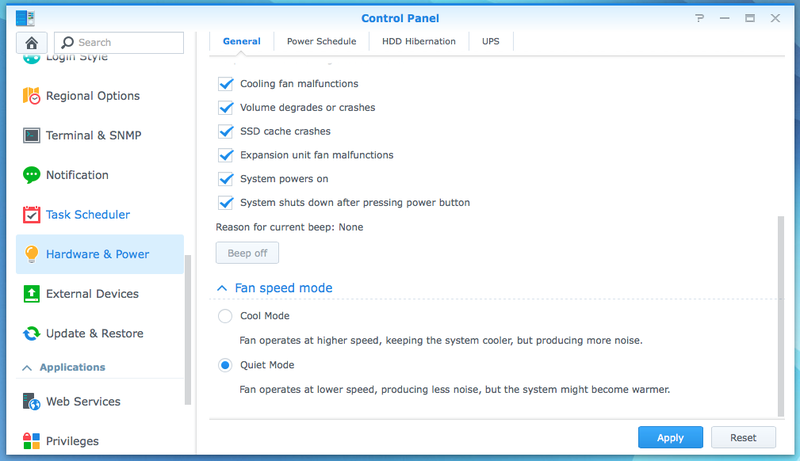 The web-based interface allows adjustment of fan mode between "quiet" and "cool." Frankly, I can't detect any real sound difference. I've only ever had one issue with the DS3612xs. After I initiated a reboot to deal with a Time Machine issue (Mac's fault, not Synology's), my original box failed to boot up. I was met with a flashing orange status light on the front panel. I panicked. A second attempt at rebooting also failed. Searching Synology's website, the prognosis wasn't good - it appeared the volume "crashed" (whatever that means). Turns out, though, that this wasn't really the problem. "Synology Assistant" running on a Mac. It listed my box, but said something to the effect that the OS was trashed, and gave me an option to attempt to repair it. I started the repair with my fingers crossed. The box rebooted itself, and - horror - it no longer appeared on the list of NAS's found by the Synology Assistant and never booted up. Now I really panicked. As a last-ditch effort I rebooted once more. This time it came up and everything was fine. That was a year ago, and I've had no problems since. While this was certainly no fun (and was the impetus for me to finally go buy a backup), in the grand scheme of thing it was no more than a hiccup. The up-time on these boxes is measured in months - I typically reboot only when upgrading the OS. I certainly had a much rougher time keeping my ReadyNAS's running smoothly. Each of my ReadyNAS's is hooked up to its own UPS. This allows the boxes to cache writes - rather than stopping everything to write every byte as soon as it is received, the box can do so when convenient because its extremely unlikely that it will be suddenly powered off before the data can be written. This increases performance. And, as a general rule, the use of UPS's increases reliability and decreases the likelihood of horrific outcomes resulting from power loss at inopportune times (like in the middle of an OS upgrade or the critical stage of an array rebuild). Each DS3612xs has four USB ports on its back side, one of which is hooked to the UPS. This allows the UPS to notify the DS3612xs of power loss so that it can shut down gracefully before the UPS battery dies. I originally had both DS3612xs's on the same UPS, using the DS3612xs's "networked UPS" facility to allow the first DS3612xs, which was connected to the UPS, to inform the second DS3612xs of UPS battery status. This didn't work so well because the power draw was too great, and the UPS gradually lost battery power despite being plugged into working wall power. UPS options and status information. 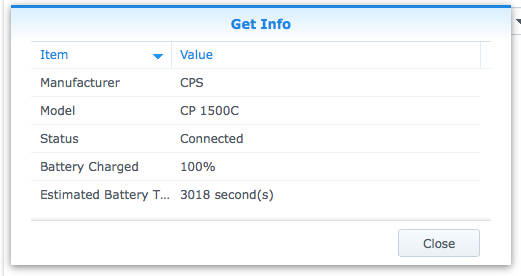 The CyberPower 1500C that's connected to this box claims 900W capacity (it's a 1500VA UPS), and the Synology NAS believes this is enough to keep running for around 50 minutes in the event of power loss. By default, hard drives are hibernated after 20 minutes of disuse, which should increase lifetime of the disks. 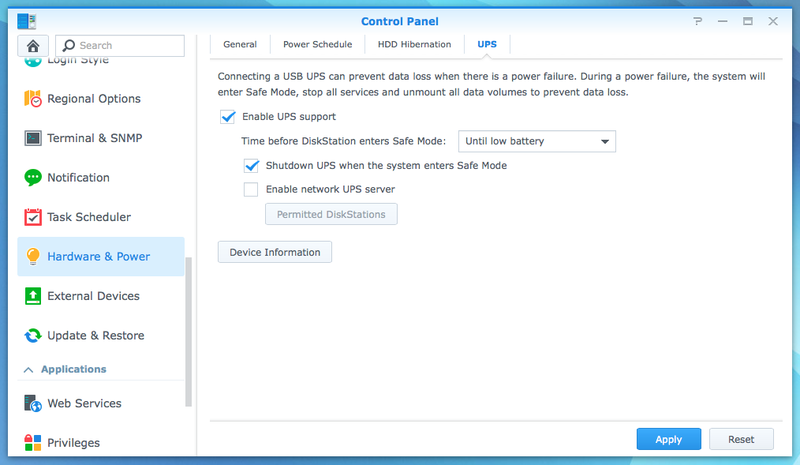 There's an option to schedule power-off and power-on of the box itself, which I haven't used - given the number of devices connected to the boxes, while it may be safe to shut the boxes down at 1am until 6am most nights, I get to nervous that this may cause more problems than it's worth - in my experience NAS's (and, for that matter, PC's and Mac's) are more likely to get into trouble at boot-up than at any other time. It's also possible to schedule extended S.M.A.R.T. tests, which can (sometimes) provide early warning about impending drive failures. 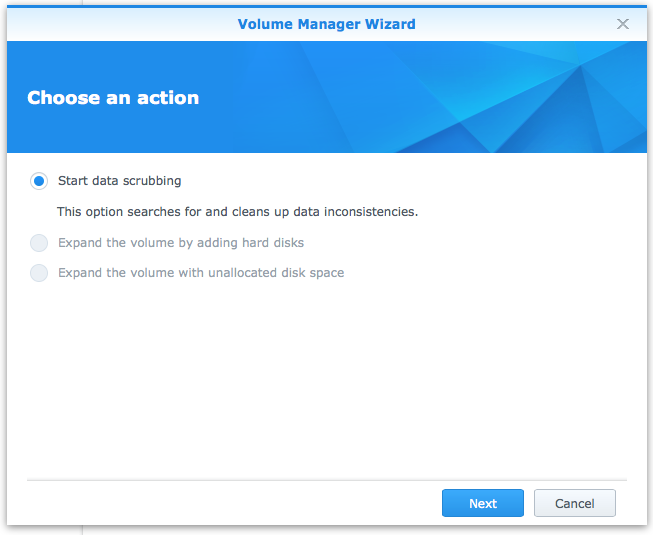 There's also an option to perform a "data scrubbing" procedure, though for some reason this cannot be scheduled. This essentially checks all the redundancy data making sure it's all consistent. While RAID prevents loss of data due to sudden drive failure, there's a second mode of failure to worry about - sometimes, due to cosmic radiation, bad luck, or gremlins, bits randomly flip from 1 to 0 or vice versa. The NAS doesn't constantly check for this - it can only detect issues when data is being read or written. If the bit that is flipped isn't being read or written, and the same bit flips on two or more (depending on redundancy option) drives, data can be lost. For this reason it's a good idea to periodically check and fix the redundancy data so that any bad bits are detected and corrected before they occur on enough disks to cause data loss. This can be done from the Storage Manager in the web interface by selecting a volume and clicking "Manage:"
This takes around 24 hours on my system, and I tend to run this about once a month (unless I have had to run a rebuild during the month because of added or replaced disks. In that case, data scrubbing is done as part of the rebuild). It would be nice if Synology would add an option to schedule this automatically in a future OS revision. OS update options. 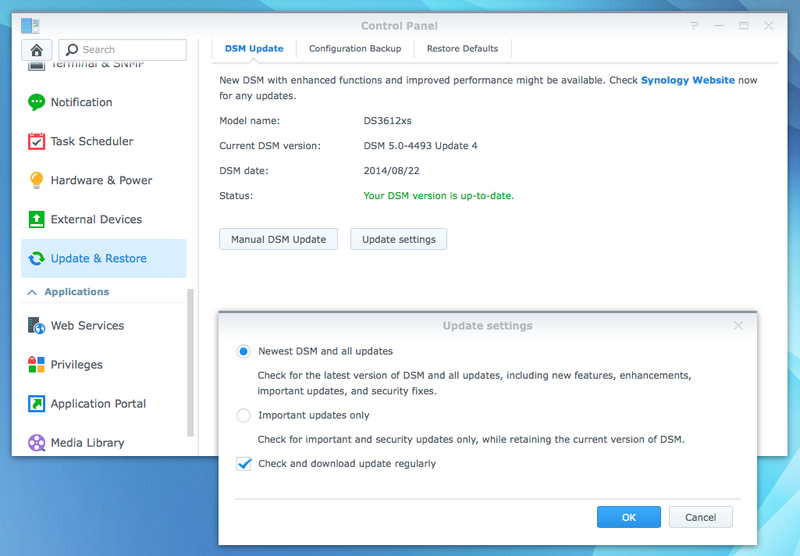 The Synology OS is named "DSM." Once the update is downloaded, you are notified (using one of several possible mechanisms, including push notifications, SMS, email, etc.) and can start the upgrade process, which always involves a reboot. The reboots proceed quickly. Although the web interface provides a 10 minute reboot timer, in my experience the OS update and reboot cycle seldom takes more than 2 or 3 minutes until the system is fully up and running. As mentioned earlier, data on a NAS, if irreplaceable, should always be backed up. A NAS, though fault tolerant (for the most common types of faults) is not its own backup solution. Ideally one should backup off-site; backing up onto another disk in the same house is of limited value if natural disaster wipes out everything. Synology NAS's natively support multiple off-site backup solutions via apps that can be easily installed and activated. In my case, however, this technique is not practical - cloud-based backups, while getting cheaper, are still prohibitively expensive considering that I'd want to backup multiple terabytes of data (all my photos, at the very least). Instead, I rely on a layered approach. First, I upload all of my photos onto a grandfathered unlimited Flickr account. This isn't ideal, as Flickr doesn't store RAW files, but it gives me some peace of mind. More generally applicable, I also periodically back up onto an external drive which I connect by USB directly to the NAS. I then use magic Linux command line voodoo to synchronize the photos directory with the external disk. I do this from my Mac but it can also be done by using ssh or telnet to bring up a terminal window on the Synology box itself, for those so inclined. When done, I bring the hard drive with me to work for safe keeping. I repeat this procedure approximately once a month. I also back up all of my shares (except the Time Machine ones) to a second DS3612xs in the same house. Note that this method works equally well if you put the second box someplace remote, like at a friend's house or at work (assuming everyone has an Internet provider with sufficient bandwidth, no data caps, and the remote network doesn't forbid the process with firewalls and such). This provides me with additional comfort because while disasters that wipe out both boxes are possible, they aren't all that likely. In the event of a more likely failure of one box, I can switch to the other and keep on plugging away while the broken box is fixed. This also allows me to have at least one backup of the movies data, and the backup is always up-to-date (or very nearly so). It's pretty new, only appearing in recent OS updates. My personal solution predates this by quite a bit. It appears the NAS's must be identically configured (number and sizes of disks, perhaps volumes, etc.). It looks like one might have to build volumes anew to get it to work. I'm not entirely clear on this, so perhaps my hesitancy is unwarranted. Shared folder sync is essentially a user interface wrapped around the UNIX rsync command. This feature can be used to synchronize two folders so that if one changes, the changes are reflected opin the other, even if the folders are located on different devices that communicate over a network. To set this up, I designated the new DS3612xs as a server to receive data and the old DS3612xs as a client to provide data. I do this by going into the settings on each of the two boxes via the web interfaces. I set up separate jobs for each share I wanted to back up (to enable easier debugging. It is quite simple to specify multiple shares to synchronize as part of a single backup job). I also chose to "sync on modify." This means that as soon as I add a new collection of photos or a new movie to the main NAS, it is detected and copied over to the other. This is most appropriate when modification of data is comparatively rare, as it generates a lot of network traffic. The end result is identical shares on both devices. The shares on the target device are automatically marked "read only" so that they cannot be modified. This prevents possible data loss if I get confused as to which server is which and try to write data into the backup that conflicts with the data on the original. If I ever need to put the backup into production as the main NAS I can turn on write permissions at that point. My only gripe is that it's not easy to see what's going with the backups. The Shared Folder Sync tab on the Backup & Replication app in the web-based user interface only reports whether a backup is currently under way or not, and there are no logs stored anywhere on the device to indicate progress. I've learned to trust that the backups are proceeding apace, even when it looks like not much is happening, and so far my trust has not been misplaced. Finally, the CPU heatsink is passive (i.e. fanless), but will spin up a fan if necessary to keep the CPU cool. This is a place the Synology NAS's really shine. As mentioned, the boxes run an OS called DSM which provides a web-based user interface. One simply needs to fire up a web browser on any mobile device or computer and point it at the appropriate website. If properly setup, access to this website can be done from outside your local network, either by setting up an account on the Synology website, or by using port mapping with your own router. resized and dragged around the screen just as if you were running a "real" operating system on a normal computer. On the desktop are icons for File Station, Package Center, DSM Help and Storage Manager. It's possible to drag any application icons you'd like from the "start menu" to the desktop. On the bottom right are found the "widgets." These can be toggled on and off using the button second from the end on the right side of the menubar. There are various widgets that can be added and removed from the widget box. The menubar also has buttons to allow direct access to notifications, user settings and system behaviors like shutdown, and search. Pressing the button at the top left of the menubar reveals a list of applications that can be launched. Some of these, like Control Panel and Support Center, are always there. Others, like Video Station and Surveillance Station, are applications that were installed via the built-in "Package Center." (Synology calls these installable apps "packages," in a nod to Linux terminology I suppose). The control panel provides a central location for various settings and preferences. It's divided into four categories: File Sharing, Connectivity, System, and Applications. In the File Sharing category are various options to allow creating users, creating shares, determining what users can access which shares, etc. The "File Services" settings allow configuration of a vast array of file sharing protocols, including Mac (afs), Windows (smb), UNIX (nfs) as well as protocols like webdav, ftp and sftp. In short, pretty much any kind of client device can communicate with the Synology boxes. The Connectivity category allows configuration of networking protocols, and permits configuring access to the data (or configuration interface) of the box from outside the network. "QuickConnect" allows one to create an ID on Synology's cloud servers. This ID can then be used to remotely access the box without having to configure one's router for port forwarding. The "External Access" selection provides an ability to automatically configure your router to forward appropriate ports for any services you've enabled on the box. I've tried this mechanism with my Airport Extreme router and found that it worked fine. As earlier mentioned, there are four USB ports, and these can receive wifi or bluetooth adapters. With a wifi adapter, the box can even be configured to act as a wireless router. The System category permits configuration of telnet and ssh access, UPS and power saving options, updating the OS, and mounting or dismounting external hard drives connected to the USB ports. Finally, the Applications category contains configuration options corresponding to applications that have been installed via the Package Center. In short, DSM provides a very simple and familiar point-and-click interface for controlling its behavior and its features. The interface is also layered - beginners can use the "EZ-Interface" wizard to configure outside access, whereas experts can manually configure ports for various services and configure their router themselves. Pretty much everything can be tweaked, but the default behaviors are reasonable choices for most users. Though I haven't made qualitative measurements, the DS3612xs is faster than the ReadyNAS devices it replaced in every way. I have never experienced any issues streaming videos to multiple Apple TVs simultaneously, and uploading files onto the devices is far faster than with the ReadyNAS boxes I've used. As far as data transfers, I've noticed that the speed is much better with large files than a large collection of small file. The initial backup from one DS3612xs to another, consisting of about 7 TB of data, took around 4 days. So far I haven't suffered any dataloss using this setup. I have had occasion to run scripts to compare directory structures between the two boxes, and they have always turned out to be identical. I certainly have a lot more confidence now that my data will be where I put it. The DS3612xs offers many more features (mail servers, web servers, PHP scriptability, iSCSI, companion mobile apps, webcam/surveillance support, personal cloud, etc.) I've used, or at least tried, many of these features, and will report on them in the future. I've only personally used the DS3612xs, but Synology offers many other products, both desktop-oriented and for racks. All prices below are for diskless units. It's trivially easy to add your own disks. 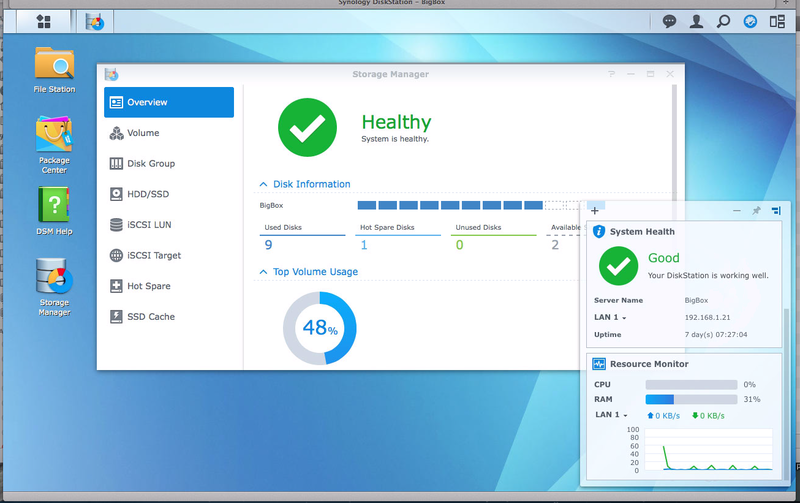 Synology also makes many units with four or fewer disk slots, but such units provide significantly less useable-space to redundant-space tradeoffs. For example, in a 5 bay unit, only 3 or 4 drives are available for storing actual data, depending on the user's choice of RAID level. 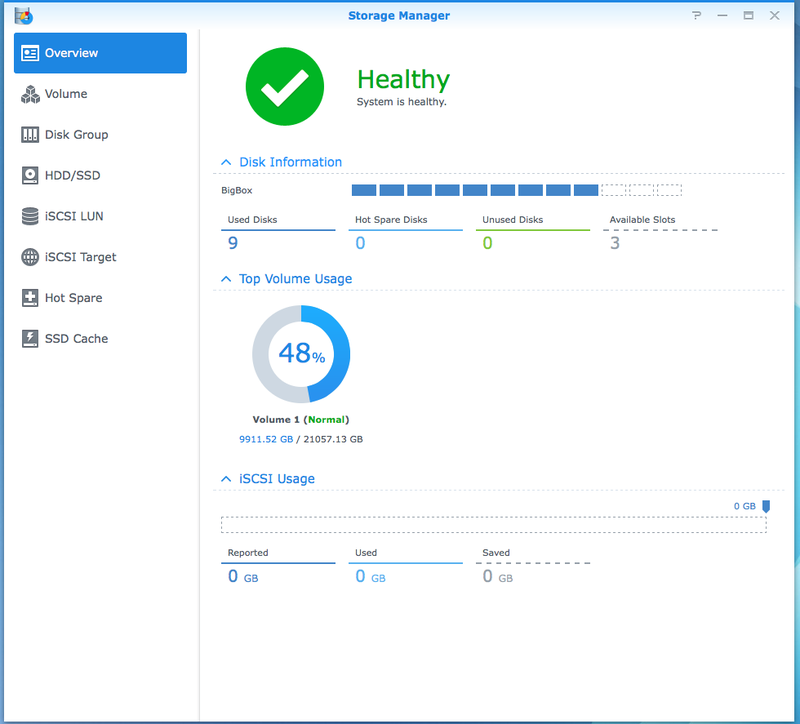 The DS3612xs has proven to be a reliable solution for my data storage and sharing needs, in large part because of the reliability and simplicity of Synology's DSM operating system. Any NAS solution that does more than provide a single share out-of-the-box adds some levels of complication, but Synology does a better job than some of its competition at minimizing hassles and providing a layered approach to functionality. In particular, any of the 5-or-more-bay solutions I discuss above should provide a decent growth path for years to come while doing a good job of preventing data loss. The higher-end boxes support more growth options, including more disks, the ability to add faster networking, etc., but even the DS1513+ should be able to grow with most people's data needs for a very long time. I reiterate that one should never keep just one copy of any data that one doesn't want to lose, even if that copy is on a NAS. However, pairing any of these devices with a sound backup strategy, whether it be a plug-in USB backup drive or using the built-in cloud backup capabilities of these boxes, should provide a good level of safety for your critical data.